This pattern is available from springtidefarm.com for $5.00. 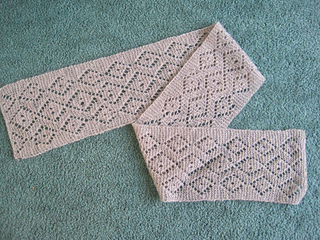 A lovely, lacy scarf with a striking geometric pattern that, due to the material, is surprisingly warm for it’s weight. 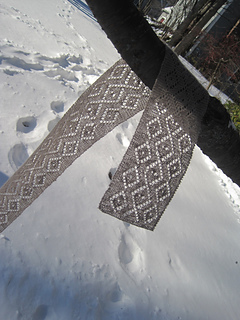 The design is fairly simple for new lace-knitters, but the lace repeat is complex enough to make it an interesting knit. This pattern includes a chart for the diamond repeat. 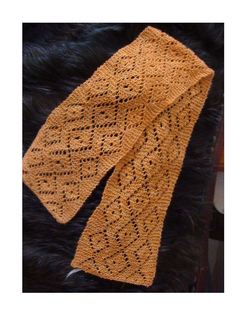 Purchasing yarn from Springtide Farm entitles you to a free pattern! Check out our website or visit our booths at the Common Ground Fair in Friendship, Maine or the Sheep and Wool Festival in Rhinebeck, NY.